Design apartment buildings of just the right size, using as few rooms as possible! Welcome to the Math Architect Game (also known as Math Apartments). In this game, you are an architect. Your job is to design plans for apartments, like the one shown at the right. To play, you do a series of projects for your boss. For each project, you are told how big the apartment should be. 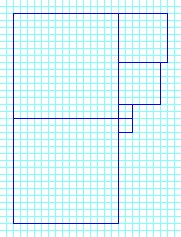 Then, you add square rooms to your plan until you get the correct size. After each project, your boss will reward you with a commission, depending how well you built the apartment. This is your score in the game. Try to earn as much money as possible! The fewer rooms you add to the apartment, the higher your commission. So, think carefully before you start adding rooms! If you make the apartment too big, the customer won't pay anything for the project! You'll earn nothing, and your boss will be upset. Four mistakes like that and it's game over! So if you're ready, scroll down and start adding rooms to your first project! If you enter your name, school and country, you have a chance to get into the high scores table! 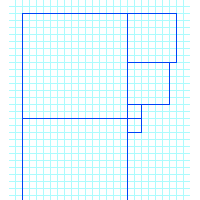 Using four square rooms to make a 100 ft2 apartment is much less impressive, since a single 10x10 room would do! See if you can get your name into the High Score Table! If you enjoy this game, you might like to read some tips on playing the game offline, with pencil and paper.